Located in a pedestrian street just behind the Santa Maria del Mar cathedral, on the 3rd floor of a building without elevator. The apartment is very bright, with large exterior living room and fully equipped American kitchen. The living room leads to spacious master bedroom with large fitted wardrobe and en-suite bathroom. 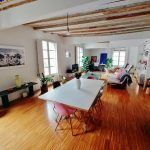 The whole apartment has been renovated to a high standard with lots of attention to detail, with an effort to maintain the original features such as the ceilings with wooden beams, exposed brick walls and the mosaic floors. The apartment comes fully furnished and ready to enter, with an eclectic mix of furniture giving the space a charming yet comfortable feel. It also has air-conditioning and internet. 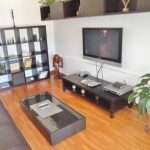 A great apartment for a single person or couple looking for a unique space in El Born.